Providing emergent and non-emergent pre-hospital basic life support to the citizens within the cities of Preston and Fountain, and the surrounding townships. The Service has 25 members and 2 rigs equipped with basic life support. The Preston EMS building is located at 217 Fillmore Street West. 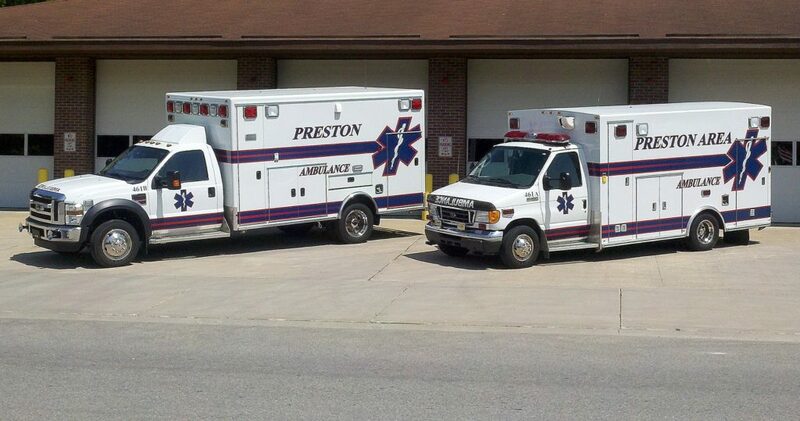 The Preston EMS office is located in City Hall (across the street) at 210 Fillmore Street West. City Hall is located on the northwest corner of the Courthouse Square in the lower level of the Preston Library. City Hall is open Monday thru Friday from 8:00 a.m. to 4:30 p.m.
Have you thought about becoming an EMT or EMR. Contact us today for more information, as classes are starting soon with limited availability. Become part of our TEAM!